Did MH370 Plunge or Ditch? The general-interest media has seized hold of a debate that his been raging on this forum for quite some time: after the last communication between MH370 and the Inmarsat satellite at 0:19, did the aircraft spiral unpiloted into the sea close to the 7th arc, or glide into the ocean under pilot control with the flaps deployed for a gentle, Miracle-on-the-Hudson type touchdown? I’ll explain why, but let’s back up a bit first. In the picture above, taken from the ATSB report “MH370 – Definition of Underwater Search Areas,” released on December 3, 2015, we see the final sequence of events believed to have occurred before the plane vanished for good. Sometime around 00:02:30, the right engine ran out of fuel and flamed out. At 00:11:00, the satellite data unit (SDU) transmitted its scheduled hourly ping as usual. A few minutes later, at 00:17:30, the left engine ran out of fuel and flamed out. This caused a systemwide electrical supply failure, and the SDU powered down along with everything else. The ram air turbine (RAT) deployed to provide emergency hydraulic and electrical power—but this would not include the SDU or the flaps. 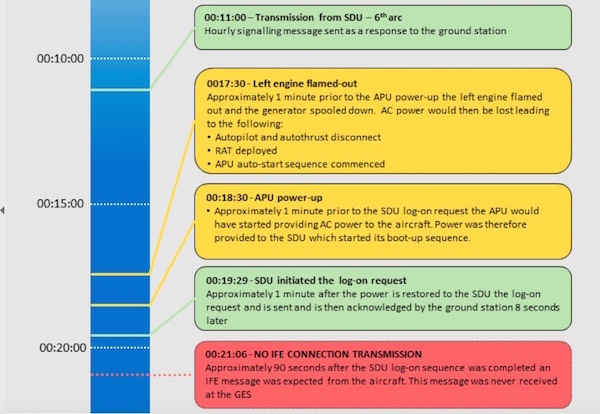 One minute later, the APU kicked in and restored electrical power, and a minute after that, the repowered SDU logged back in with Inmarsat, creating the “7th ping.” Then, within seconds, the APU exhausted the dribble of fuel in its fuel lines, and the SDU lost power again. When the 7th ping occurred, therefore, the plane had been without engine power for two minutes, and had spent approximately 15 minutes before that slowing and descending from cruise speed and altitude under the power of a single engine. Thereupon, it descended without autopilot inputs. So: what happened next? There’s one major problem with this scenario. If this is what had occurred, then the plane’s wreckage would have been found on the seabed within the current search area—indeed, it would have been found long ago, quite close to the 7th arc. So we know that the plane didn’t plummet unpiloted into the sea. Well, then, since the plane hasn’t been found in the search area, perhaps someone held it in a glide so that it flew beyond the boundaries of the current search area and made a gliding landing onto the sea surface. This argument was advanced in the recent Australian 60 Minutes program in which crash investigator Larry Vance said that the condition of the flaperon meant that it had to have been deployed, and then knocked off by impact with the water. A controlled ditching scenario requires engine thrust to be available to properly control the direction and vertical speed at touchdown and to provide hydraulic power for the flight controls including the flaps… This evidence is therefore inconsistent with a controlled ditching scenario. Finally, it’s simply not true, as Vance asserts on the show, that no wreckage from the interior has been found. It has, and in quite small pieces. Thus, while it’s possible that someone in the cockpit was hoping to pull of a “Miracle on the Hudson,” they must have been attempting it at high speed, without flaps, and they failed. What we’re left with, then, is a fairly narrow range of possibilities. We know that the plane was under pilot control at 0:19. If the ATSB’s interpretation of the 0:19 BFO data is correct, it was plummeting at high speed. Therefore the plane must have been in a suicide dive and would have impacted the ocean to the northeastward of the current search area near the 7th arc. If this is the case, then it is quite feasible that an extension of the current search could find the plane. Alternatively, the plane was under pilot control, and the ATSB’s interpretation of the 0:19 BFO value is incorrect, then the plane either glided past the current search area and then crashed into the sea, or else wound up northeast of the current search area and then either plummeted or glide-crashed. If this is the case, then the potential search area would be huge and far more daunting. Detailed analysis of BFO samples taken from other flights showed a high degree of consistency for the signalling message frequencies, with the exception of those that were performed immediately after the initial logon process. This called into question the BFO measurements after the log-on sequences at 18:25 and 00:19. However it was also determined (by the same method) that the first message transmitted by the aircraft in the logon sequence, the Logon Request message, did provide a consistent and accurate BFO measurement. This means that we can use the Logon Request message information from 18:25:27 and 00:19:29, but it is prudent to discount the measurements between 18:25:34 and 18:28:15 inclusive, and the one at 00:19:37. The article in the Australian that I mentioned previously described the ATSB’s current interpretation of the 00:19:37 BFO value as “new data ­extracted from the signals.” An explanation of how the data is new would be very welcome. An Australian government agency has secretly retracted its claim that international scientists and air crash investigators had reached consensus that ­Malaysia Airlines Flight MH370 went down quickly in a “death dive” rather than being flown to the end by a “rogue pilot”. The backdown indicates that the Australian Transport Safety Bureau no longer commands unanimous support among its global advisory group for a public relations narrative it is running in conjunction with the Malaysian government and Malaysian Airline System Berhad. A bit snarky, but they may have a point. @DrBobbyUlich: Your path ends close to my BEDAX-SouthPole path (180T). However, one big problem with this and other solutions ending in this vicinity is that GO Phoenix scanned this area and north to about 33S latitude, albeit at a narrower width than further south. Yes, unfortunately a computer game and a suggestive plot in Google Earth is compelling evidence for simple souls receptive to such suggestion. I see you are ignoring my request for your one version of events. I might be simple, but I am direct and honest. You, on the other hand, could find ample reason to dispute that the sky is blue at noon on a clear day. Google is your friend. You should use it when you are not sure of what you are talking about. Is that the request you are referring to? @DennisW: I don’t feel obliged to reply to requests that insinuate that I’m “incredibly stupid”. A clear case of reaping what you sow. Closing comment here, please add your thoughts to the most recent post, unless you are a troll, in which case, you know, just go do something else. @Ge Rijn, I am not closing discussion of any topic, all free expression continues to be welcome, I just want you to talk about it somewhere else. Next Next post: Free the Data!